Tablets have come down so far in prices lately I could probably post a deal a day on them, but I make sure the ones I do promote have good reviews. 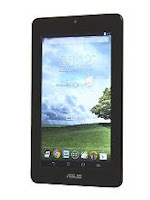 This ASUS 7" MeMO Pad Tablet is on sale for $90 at Newegg.com. That's 40% OFF the retail price, the lowest price I could find online, and comes with FREE shipping. It's also gotten great reviews. It offers a large 16GB storage capacity (plus a micro SD slot to double it to 32GB), HD camera, and thousands of apps waiting to be downloaded. If you're looking for a simple, high-quality tablet at a price that isn't as much as a BMW car payment, this one is the one for you. Click here to view the deal at Newegg.com.